It was 9 am in the morning and a group of 20 members sat listening with rapt attention to the dean of the college talking about the importance of learning literature searching skills for medical professionals. Only today the listeners were not students of the medical college but the faculty, and the ‘faculty’ was QMed! 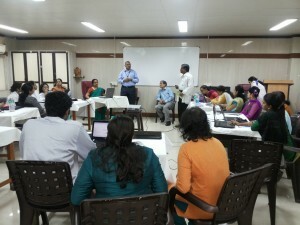 The faculty members were very participative and enthusiastic. They were a lot of healthy discussions and they sought clarifications wherever required making the training session very interactive. We need more like Dr. Moulick and Dr. Vijay Singh from LTMMC took the initiative to organize the workshop. The observations were that workshops for the faculty are as much needed as they are for the students. We need to work towards building a system where the faculty and the students are trained in literature searching and reference management and they share a a relationship of mutual learning. The faculty should insist on students mentioning their search strategies in their thesis/research papers and also allot certain marks for correct references. And hence the need to train and build capacities of both the faculty and the students is a simultaneous process.